Here we will have all the tips for the preparation, marinating and processes; hence, you can invite guests and show off your cooking skills with this Roasted Duck (Vịt Quay) dish among many Vietnamese Food Recipes. 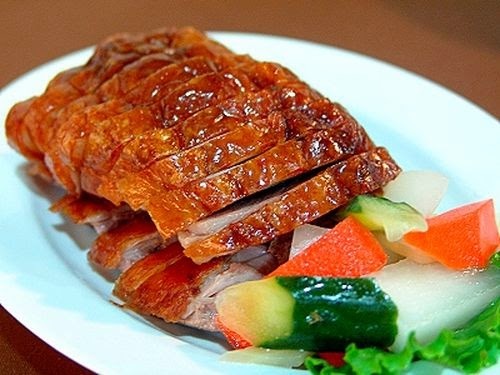 An excellent Roasted Duck must be served with crunchy skin, pink meat and memorizing smelling. Here is one of first choices of many Vietnamese Families on Tet Holiday in Vietnam. The duck skin is very dry when you put it into the oven. 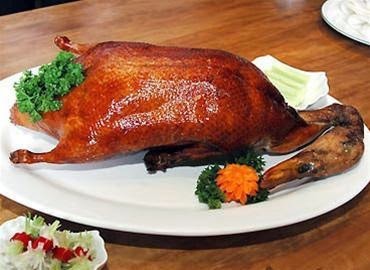 Therefore, the duck need to be dried first, the minimum time span is overnight to 1 day or 2/3 days like Beijing recipes. In order to have crunchy & shiny brown skin, malt is a compulsory ingredient. Eventhough, honey, molasses or jaggery can be used as substitutes; the final result will not be as good as using malt (melted sugar). Step 1: Get the duck cleaned. Smash some ginger and mix with white wine. Use this to rub through inside & outside the duck (wait for 20 – 25 mins to let all the smelling goes away). Clean it with cool water then dry it inside out. If the skin is torn, you can use white thread to sew, the more stretching the skin is, the better it gets when we roast it. Step 2: Mix all the spices for the inside, you can adjust this mixture according to your tastes. Use your hands to rub these spices inside the duck. For the outside, you can mix 2/3 spoon of salt with 2/3 spoon of five-spice powder, rub it on the duck skin. If you can hang the duck up high and let the air dry it, it would be the best. If not, you can hang it on a pylon with holes. Remember to choose a place with many winds to dry the duck. Marinate it in at least 6 hours (overnight). Step 3: Add the spices for the outside into the stove. Just put enough boiled water to help the malt melted. Heat this mixture until it is boiled. The mixture will be quite gelatinous. Use this mixture to pour over the duck many times. Continue to hang the duck high to dry out. It depends on the weather, hence, time span will be fluctuated from 2-3 hours to 7-8 hours. Step 4: Put the duck into the oven. 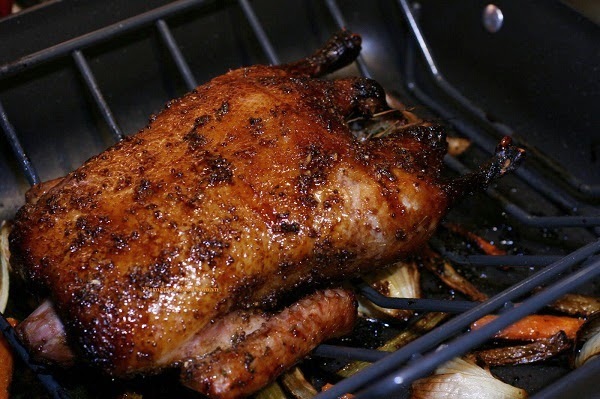 The fat from the duck during roasted time can be used to cook with vegetables such as carrot, tomatoes and zucchini, etc. However, you can roast by coal. With this step, it can increase the flavor for one of amazing Vietnamese Food Recipes. Step 5: Adjust the heat temperature & time. 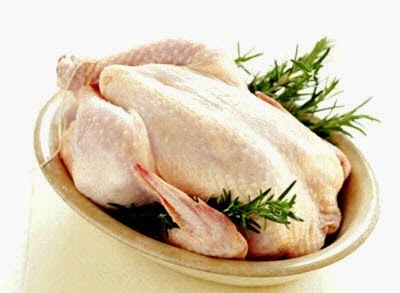 For a 1kg duck, you can roast it in 45 – 55 mins, turn it after first 20 – 25 mins at 160 – 170 Celsius degree. After the duck is cooked, turn off the oven but you still need to let it rest inside so that the fat can run out and the skin is dried. Finally, one more stunning dish from Vietnamese Food Recipes is completed. This dish is best served during holidays such as family gathers, Tet holidays, etc. Moreover, you can serve this dish with Fried Sticky Rice (Xôi Phồng). Here is the best combination for you. 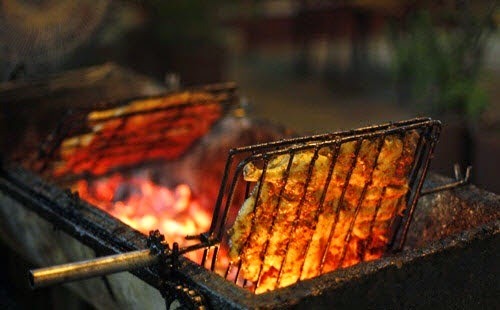 The flavour will bring to you and your family unforgettable memories. Hope you have a good time trying this recipe.